This is the thirteenth in a series of blog posts about recovering from the Gulf oil spill and from oil dependency overall. The first introduces the series. Just in time for the Fourth of July weekend, how about an Independence-from-Oil diet? You’ve heard of low-fat. You’ve heard of low-carb. This one’s low-petrol, and it’s scientifically proven to take off pounds! That’s no joke. A study announced last week found that transit users weigh less, noting that regular walking to and from transit stops, even for short distances, is enough to keep pounds off. By using transit for a year or so, the study found, a typical five-foot-five rider will take off 6.45 pounds. 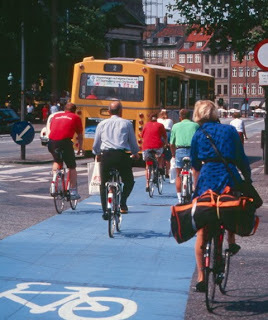 In addition, using transit reduces the risk of becoming obese by 81 percent. In announcing these results, study co-author Robert Stokes of Drexel University noted that "the prevalence of obesity ... has been strongly related to time spent in one's automobile." These slender folks have obviously followed a low-petrol diet for some time. 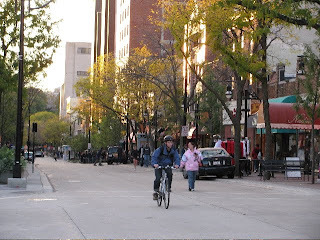 Also last week, a study about the role of bicycling in controlling weight had researchers recommending more bike lanes. Even as little as five minutes a day of bicycling makes a measurable difference in helping women lose weight, this study found. To make this easier, lead author Anne Lusk of the Harvard School of Public Health recommended that "we need to provide the infrastructure or facilities so that more people could comfortably bicycle." 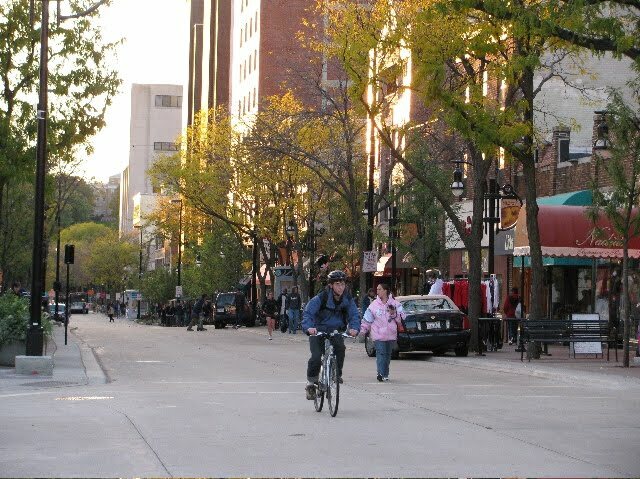 Madison, Wisconsin now limits car traffic on downtown's State Street to favor pedestrians, cyclists and transit - a policy that no doubt helps residents counteract consumption of beer and bratwurst. These results call for better public investment in transit, cycling and walking facilities. 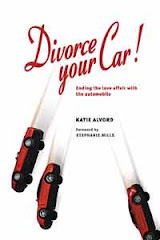 But you don't have to wait for that to go on your own low-petrol diet. A number of forward thinkers have come up with plans they call "climate diets." The one I like best suggests that we can cut greenhouse gas emissions and drop pounds at the same time by walking instead of driving for half an hour per day. In a similar way, we can support recovery from the Gulf disaster and from oil dependence as we recover from our national weight problem. Instead of counting carbs or calories, we can count car miles, and keep those as low as possible. Here are a couple of simple ways to pursue a low-petrol diet. If you don’t mind doing the math, figure out how many miles per week you drive (if you have oil change records, use the odometer readings to determine how many miles between changes, then divide by the number of weeks). Then cut that by 5, 10 or 20 percent, depending on how low-petrol you want to go, and replace those car miles with walking, cycling, or taking transit. It also works to list the car trips you take in a typical week, then select one or two of those to replace with walking, cycling or transit. In subsequent weeks, to up the number of pounds you take off, you can increase the number of trips you take without a car. Either of these methods can be used in conjunction with the Circle Game, which I wrote about a few posts ago. Any way you approach this, the more driving you can replace with another, more active mode of travel, the higher your potential weight loss – and the closer we all get to independence from oil. After a debacle like the Gulf disaster, it hardly seems we should need more motivation to reduce our oil use. For the unconvinced, however, the evidence makes this clear: petroleum adds pounds. Do we even need another reason to cut back?